The on-line registration is NOW OPEN for the 2018 – 2019 ski season! Click on the Registration button to register using the Zone4 website. If you’re unsure of the process, read the instructions below. Please refer to our Programs Page for details about what we offer or click Programs in the Menu Bar. Once you have decided on the programs, you may register several people at once. Please note that we no longer offer family ANSC memberships as we must pay an insurance fee for each individual to Cross Country Canada (our governing body). Click the Registration Button to register on-line. This will take you to the Zone4 website which handles the registration process. You will need a credit card. Click the ‘Add First Person’ button. Fill in the credentials for the person you are adding. Scroll down the page until you find the program you want. Click the button beside the program, then choose the time slot. If it is a children’s program, you will need toput in the guardian name. Scroll down. You will see ‘Basic Club Membership’. Program registration fees already include the Basic Club Membership. DO NOT SIGN UP FOR A BASIC CLUB MEMBERSHIP IF YOU ARE REGISTERING IN A PROGRAM. Continue to scroll down the page. Check the box for the Waiver agreement and click ‘Continue’. You will be asked to confirm the information. If you need to, click the ‘Edit’ button. Next, you can start the process over by adding a new person, or you can insert your payment information and submit your registration. Don’t forget to print off your membership card! Proof of membership is needed for discounts in local sports stores! 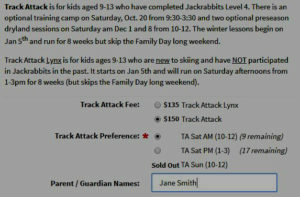 For our Children’s Programs (Jackrabbit, Bunnyrabbit and Track Attack) Registration for theses programs includes club membership, the waiver and Arrowhead Provincial Park trail fees for your child during the lesson. For Youth Programs and Adult Programs (Arrowhead Race Centre, Adult Lessons, Masters Program) Program registration includes club membership but does NOT include Park Trail Fees. Participants must also obtain a Park Trail Pass from the park office. Participants in the Muskoka Loppet and Elementary School Races do not require a Park Trail Pass as day-use permit price is built into the fee. Please email here for a registration form that you can print off and mail in.